Sometimes gimmicky things are done for gimmicky reasons, like when companies release obviously bad flavors in order to generate hype and publicity. After all, we all know there's some sadistic joy in sharing knowingly bad food with friends, otherwise those Beanboozled and Bertie Botts beans wouldn't be as popular as they are. 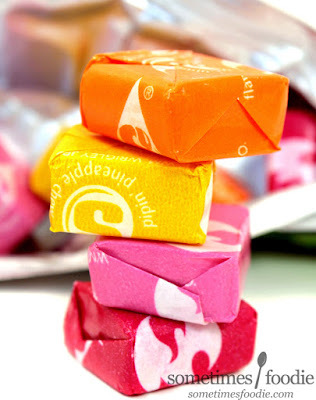 The real question is, are these Starbursts one of those items? I'm not sure. Sweet and spicy is one of my favorite combinations, like honey-hot-wings. (Oh man, I really want some wings right now...) These could either be great, and fill an area that's lacky on USA's candy shelves, or they could be disgusting flops. We won't know until we try! To set this flavor apart from the rest of the Starburst line-up, the company opted for a black background and some puny flames to the upper right corner. Visually, Sweet Heat is more of a light simmer, and even that is quite generous. I'm disappointed. This is a pretty bold product for a company that likes to play it safe. I had hoped that would translate into some riskier packaging, but it didn't. They could have covered the whole thing in flames, made it look like a burning log, switch up the colors in the yellow and red logo. Pretty much do ANYTHING different, but they didn't. Oh well, I hope the candy inside is far more interesting. Fiery Watermelon (magenta-pink) - I popped the candy into my mouth and immediately I was tackled by a tangy, artificial, watermelon flavoring more like a Now and Later than a Starburst. At first it was bright, sweet, and tangy, but slowly the heat started to kick in towards the back of my throat. It's a dry heat, I would liken it to cayenne pepper, but it's fairly mild. This won't send you running for a glass of water, but it will make you salivate a bit, and it honestly complements the watermelon flavoring very nicely. I'm impressed! First flavor is a winner! Strawberry Mango (pale-pink) - Pretty sweet name there, does this one not have any heat to it at all? I started chewing and the fruity notes are what hit me first. 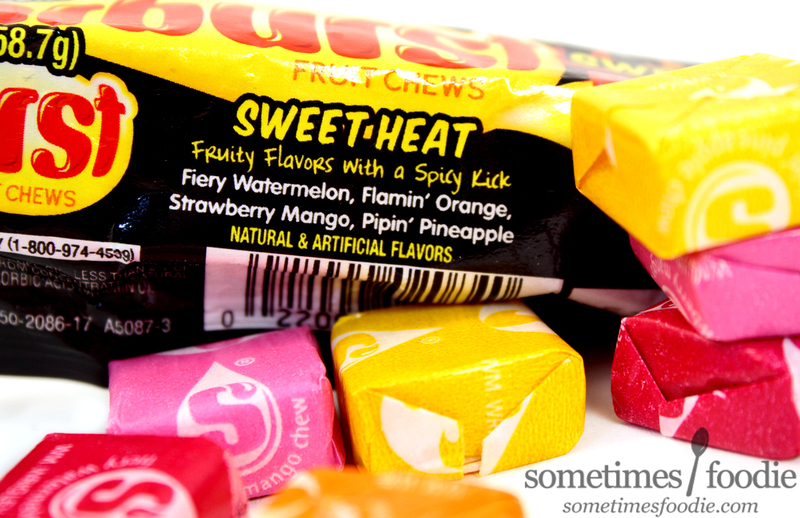 It's like a classic pink starburst mixed with Trader Joe's mango gummies, which was great, and then the heat started to kick in. This spiciness was surprisingly different from the previous flavor. It's more like a deeper jalapeno-like burn. Again, nothing intense enough to make you break a sweat, but it does hit the back of your throat with more intensity than I thought it would. This one has more of a roasted pepper-like finish, in terms of heat, that I liked, but it doesn't beat the watermelon. Pipin' Pineapple (yellow) - I think this is the least successful flavor for me. It started out being a bright with a fairly realistic pineapple flavoring, but that turns over-ripe very quickly. Kind of like a fermented pineapple, there's heat there, and it's more-so like the heat from the watermelon flavoring, but there's just something about the pineapple flavoring that's off for me. Easily my least favorite of the four, and that's odd because I normally really like pineapple. Flamin' Orange (orange) - The original, creamy, orange flavoring from the original line up with a spicy finish. It's okay, and a nice palette-cleansing flavor for the others. It's nothing to write home about, but I do like it a lot and I'd label it my number two pick. In conclusion, these are pretty great! 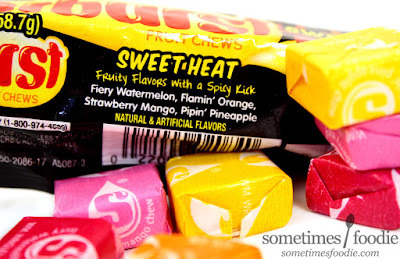 My ranking from best to worst would be: Fiery Watermelon, Flamin' Orange, Strawberry Mango and then Pipin' Pineapple. 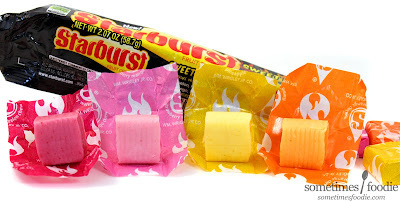 All-in-all this is a refreshing change of pace for Starburst, which usually play it safe when it comes to releases, and I'd love for this to be something they expand upon in the future. Although I'm not in love with every flavor in this pack, I do hope this mix sticks around. It's a refreshing change up from sweet candy chews, and If you like mango salsa, you'll love these. Let me know if you pick them up and tell me which flavor is your favorite!